My kiddos were great this week considering everything going on, but it is nice to know that I can stay up late and sleep in for two whole weeks. I'm waiting on my hubby to go finish up our Christmas shopping. I can't believe we have to go out tonight with all the craziness and the weather, but I'd rather do it tonight than tomorrow. These reindeer came from Just Wild About Teaching and my kiddos loved them! The reindeer facts page came from my Night Before Christmas Activity Pack. Don't forget about the Welcome Winter Sale! 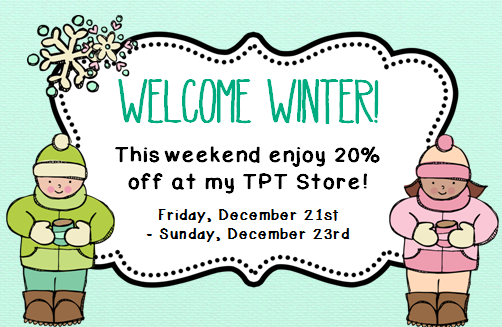 My TpT store and lots of others are throwing a 20% off sale this weekend.